Today I had a unique opportunity to experience a new aspect of Japan thanks to Expo House. All over the world alcohol is an interesting aspect of cultures because it also reflects particular characteristics of a country. Japan is a country where rice and plums are abundant. Therefore plum and rice alcohol are very popular and then a characteristic in this country that dates back to the Edo Period. I had the chance to make Japanese plum alcohol called “Umeshu”. I went with my new Japanese friend who helped me to understand some information written in papers and to make sure I understand the instructions and interesting facts about umeshu our kind instructors let us know. The activity was held in a nice Café. There were about twelve people. My friend and I were the youngest in the group. We had a large bottle of Japanese alcohol, a bag of Japanese plums, a bag of white hard big blocks of sugar, a big bottle and a small towel. First we had to clean the plums with the towel and with the help of a tooth stick we would remove the top of the plum and make some holes around the plums. While doing this activity the instructors were providing the audience with interesting information about umeshu history in Japan. Then we put the plums inside the big bottle and immediately after added the blocks of sugar. After that we poured the alcohol. Finally we closed the bottle hermetically. Now I have to wait for one year to taste the umeshu I prepared today. This is probably the most exciting thing. I will invite some friends to have a cup of my umeshu. We were asked to try umeshu they prepared one year ago and it tasted really good. I was even offered umeshu bread that is a loaf of bread filled with the plum fermented in the alcohol for one year. This was quite interesting too. We had a session for questions and answers and then everyone took its bottle. Now mine is at a visible place at my home which feels like home in Kyoto: Expo House Rozan. I am really looking forward to taste and share this product with my family at Expo House and my friends in Japan. Time flies so fast! I can’t believe that I have stayed at Expo house for over 7 months. It was the best 7 months ever! I have met a lot of friends at this place and I was able to become close with everyone of them. At expo house, we shared laughter and sadness. Our hearts connected with each other. We are like brothers and sisters, always gather together and share the ups and downs of our daily lives. Thank you all for having me and treated me as a family member. You guys make me feel like home in expo house. The farewell party was the best surprise party for me. Thanks to those people who participated all the preparation. It was a total surprise and I had a lot of fun. Starting with preparation until the end of the party, everything went really well. I was overwhelmed with how much Boss and other members have done. I loved the graduation ceremony, it one of the most interesting experience that I have had. Thank you, Yusuke’s mom and Minami for the calligraphy certificates. And thank you, Yusuke. For Everything! Leaving Japan is the hardest thing to do, but I understand that it’s not the end of the life journey. It is a new start for me, and for you! We will meet again, until then, please take care and enjoy the fun of Expo House. 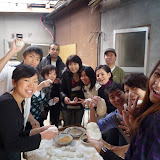 On December 30th some Rits friends and I went to make mochi the traditional way at Expohouse. Apparently, making mochi before the New Year brings good luck and I sure hope so! The first step in the mochi making process was steaming the rice using a giant gas powered steamer. It was a cold day so we all gathered around the steamer to keep warm as we drank hot coffee and tea. After the rice was steamed it was put in a big stone bowl and we all took turns pounding the rice with a huge wooden mallet. Sometimes after a strong swing of the mallet little pieces of rice shot out of the bowl causing everyone to duck for cover! After a few minutes of pounding, the rice pretty much looked like mochi. Then it was time for us all to test out our sculpting skills as we molded the mochi into small balls. There was a big table covered with flour and we gathered around to shape the large ball of sticky mochi into smaller bit-sized pieces. At this stage, the warm mochi was ready to eat. Some ate it plain, others chose to fill it with red bean paste, and both options were great! It was really great for me to have a chance to join Mochitsuki – making sticky rice event – at Expo House at the end of 2008. Although it was my second time, I really had a lot of fun as much as last year or even more. First I am so happy to not only know about one of Japanese traditions but also to participate in it. As far as I understand, there are three important stages in making mochi: Cooking the rice, pounding the rice and finally forming the pounded sticky rice into different shapes for eating. Different stages give different levels of fun. For me, I love the second stage best when I had to use a heavy wooden hammer hitting the rice in a stone bowl. Second mochitsuki, in my opinion, is more than just making sticky rice. It is solidarity work and this kind solidarity work is especially meaningful when there is a mixture of different nationalities. And I believe this is the beauty of mochituki at Expo House. This year around 20 people of almost 10 nationalities participated in this activity and I am so glad to be part of it. Last Sunday, May 4, 2008, we celebrated the first anniversary of Expo House..now Expo House Omiya. Just like the way we started last year, sushi party was still the theme of the night. A dozen plus one (Yusuke, the manager) from four countries converged for the celebration. Kamitani and Ryota (Expo founding members) from Tokyo, Mie, Tuyoshi, Yuji, Kazuma(Kyodai) formed the Japanese group, Earle, Dana and me from the Philippines, Felix from New Zealand, Mary from Thailand and Derek from Hongkong. The highlight for the evening was the sushi making contest. Four teams were formed dressed up in different costumes: the samurai, festive gear, high school and crazy outfit. A lot of ingredients were set on the table. It was fun and everyone was busy in preparing their sushi creatively and had interesting taste (fusion of different taste buds). I remembered a group prepared High School Energy Sushi, others did Asian Sandwich Sushi, Philippine Islands Sushi, Wasabi Magic Sushi and Expo House Anniversary Sushi. Well, laughter was in the air during the judgment moment for you could see the mixed facial expressions of the panel while tasting the varied sushi. Well, I guess you got what I mean. LOL. 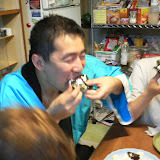 After which, Yusuke blew the candle of the anniversary cake brought by Mary. Then everyone had their share of it and continued talking with each other, sharing their lifestyles in respective countries, as well as, here in Japan. Later, some played the Wii and interactive game which made the night livelier. Though the weather was somehow humid, but the warmness of the group made it subtler. Then all of us helped cleaned the area.. some washed the dishes, others were putting garbage in the bags, others arranged things on their proper places. This action is on the attitudes that I like in the Japanese culture. It would not be a burden for the host in throwing a party. It was near midnight when people bid good byes. Honestly, they went home with big smiles. After the party, I was alone in the table in the dining area and drinking coffee raving with this nostalgic mood. More than a year has passed ..I thought it was more. I was in memory lane. Expo House shared a great number of fun last year. We had Japanese Traditional Food parties like takoyaki, okonomiyaki and other gastronomic delights, Halloween party with International cuisine, birthday bashes ( I had mine most memorable for it was also Christmas Party, with 41 guests from 12 different countries), New Year Eve Party, the Welcome and Sayonara Parties. Wow…it was so fun making friends all over the world in one setting. Well, I can’t help but SMILE. Expo House really lived for what it promised..convergence of international understanding. Now it has a new one again ..the Expo House Rozan….and another one on the way. I believe this tradition started in Expo House Omiya will go long, long way in making someone, be a Japanese or Gaijin, have a memorable, colorful and fruitful stay in Kyoto. Kampai to the 1st Anniversary of Expo House! Many more years to come, many new faces to smile for great fun!!!!! I first met Yusuke(manager) as my host family during my orientation days with JICE at Ibaraki. For short a time, he gave us a sight of what Kyoto is about and I had the chance to have dinner with his family. I thought that was it but I realized that it would be good to continue communicating with him after all I will spend my two years studying at Ritsumeikan University in Kyoto. I first stayed near the famed Kinkakuji Temple. The place was good and it was a meeting venue for friends. I sometime invited Yusuke during those occasions. But the silence of the area was eating me up and I felt isolated somehow. One time, Yusuke mentioned of his plan of making an Expo House..an international guest house. I really believed that it was a great idea. That time it did not really don on me of transferring a new place because of the requirements needed , I just can imagine the difficulties I would be facing. Months passed.....changing seasons felt. One occasion, Yusuke brought the idea back of letting me live with him at the Expo House. Telling him my predicaments, he assured me that he will help me with the transfer. He even showed me the house even it was still under construction. Honestly, the sight changed my views and that moment I wished I will be able to live in that house. It was just fortunate I was given a go signal to transfer.....then that made me anxious somehow during those days...Did I have the right decision? Will the advantages outshine the disadvantages of the ttransfer? I was floating ...but I had decided to accept Yusuke proposal of moving in at the Expo House. True enough.. Yusuke helped me in moving out my things and helped me in the transfer documentations, from updating my Alien Card and Insurance to changing of address with my bank and mobile provider. I was really, really grateful to the assistance Yusuke gave to me. Honestly my friends told me that I was really lucky in changing house relatively with ease. April 1, 2007 was my official first day in Expo House...making me the first occupant. A new life ..
a new mindset.... a beginning of a better "something"
What is up with Expo House? What made me really lured to stay here even knowing I would not be the only one staying in the house? Honestly, first is that it is a good deal. The rent covers the utility bills and internet connection. Second, I could feel the good aura of the place...I just felt comfortable. Yes, I still have the bedroom with tatami mats and the house displays spacious kitchen and living room with kitchen amenities (microwave, toaster, etc. ), good toilet and bath and even recreational stuff (game boards, books and the Japanese new in English). Third, I would have the chance meeting other nationalities and know their culture. Fourth, the Expo house is in the Nishijin area....popular for the Japanese textile. I love kimono and Japanese stuff....I really do not know why they are into my nerves. Last but not the least, I got a home with Yusuke and his family.... I really felt I belong. No regrets in moving here at the Expo House. It is indeed a great CHOICE!!! !